this poor kitty looks miserable. 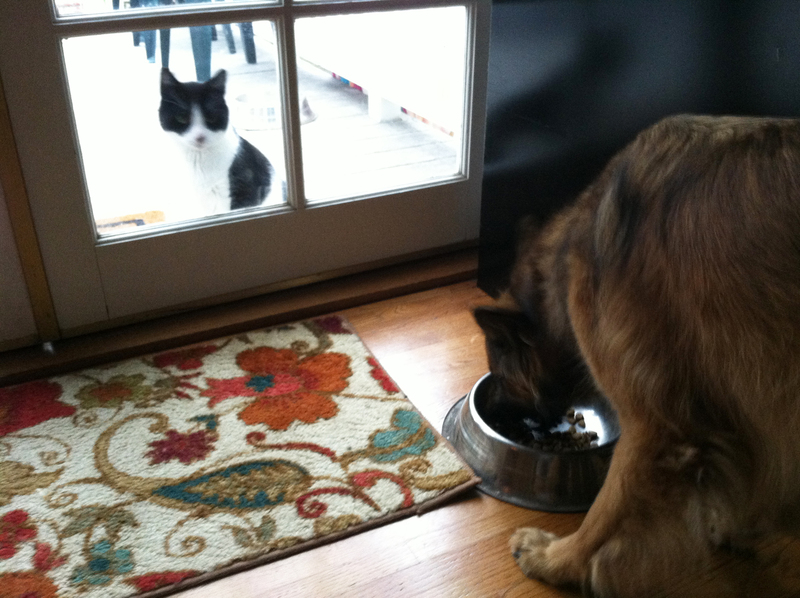 he just had his breakfast, but he’s still hungry and he wants the dog’s food too. i understand perfectly. when it comes to food, i think more is always better. but this doggie’s food doesn’t look all that good. i prefer a big southwestern omelet with chopped unions and spicy jalapeno peppers and crumbled bacon strips and avocado and lots of salsa. now those left-overs are worth waiting for! 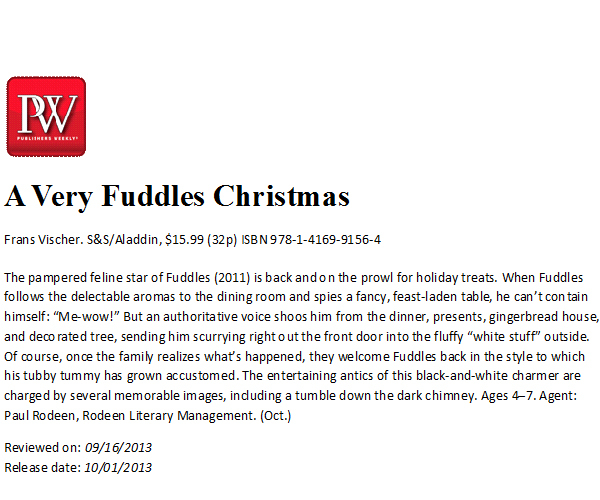 A Very Fuddles Christmas review! yay! the first review for my new book is in! read all about my new christmas time adventure! 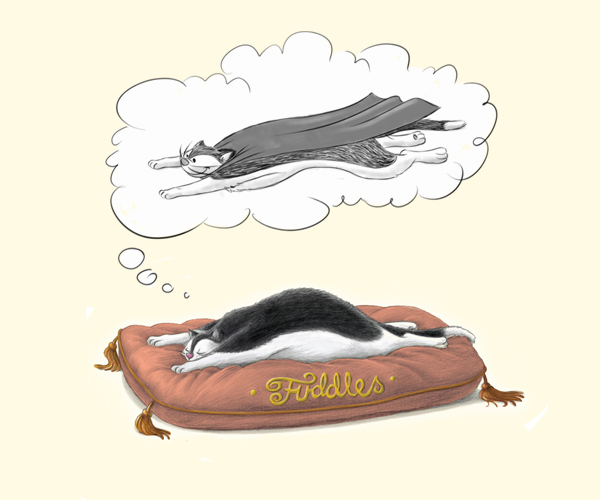 In this second story about Fuddles the cat (Fuddles, 2011), he is accidentally locked out of the house on Christmas Eve, leading to a snowy adventure for the pampered feline. In the self-centered manner of most cats, Fuddles thinks all the special Christmas decorations and preparations must be there just for him. There’s an unguarded table with a huge turkey, packages with interesting ribbons, and an enormous tree with lights and sparkly ornaments, just waiting for him to climb. After the Christmas tree topples to the ground, a befuddled Fuddles runs out the open door just as guests are entering. But Fuddles is clearly an indoor cat. Suddenly, he is in a frozen, white world, and he can’t get back into the house. He rambles around his yard, plowing through the snowdrifts, before finding his way back into the house by sliding down the chimney. 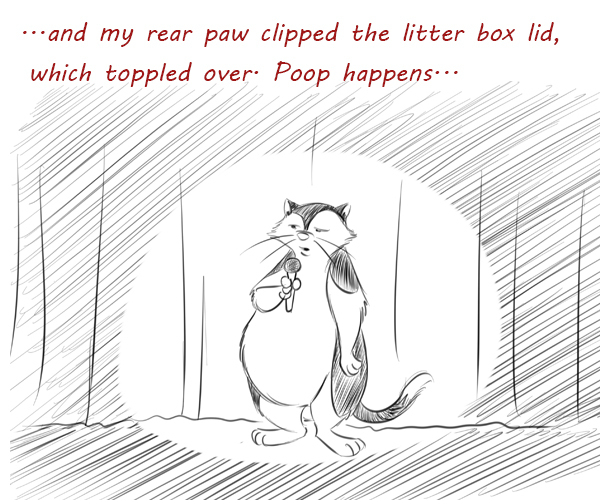 Vischer, an animator for Disney, provides polished, computer-generated illustrations, showing off the cat’s comical, high-energy antics with effective use of display type and white space. He uses a satisfying array of perspectives, including a surprising, all-black spread of the cat sliding down the chimney that is laugh-out-loud funny. i have great dreams about doing great things, like a super cat flying through the air to rescue a falling pie from a bakery delivery truck, or retrieving a pizza from a restaurant thief, or returning a lollypop to a crying child who dropped their candy bag out of a speeding train. all the things i could do if i had superpowers! i do have a super powerful appetite, and today i’m super-hungry for chicken flautas with picante sauce and monterey jack cheese and corn tortillas, and maybe a chocolate ice cream banana split for desert! look how animated and merry i am! pass this on to all your friends and family, so they can watch me flop around in the snow! i’d much rather be inside, cozy and warm on my fluffy pillow, with a bowl of hot chicken noodle soup and some yummy crackers. 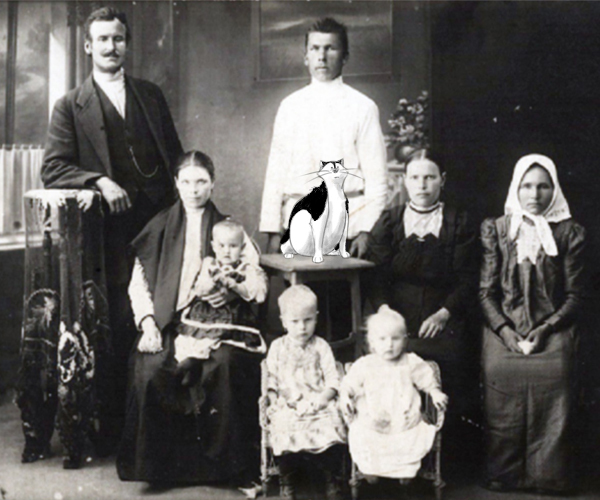 i love those old family portraits. everybody gathered, carefully arranged, and sitting perfectly still without smiling. speaking of cheese, i’m having cobb salad tonight, smothered with bleu cheese and a ton of chicken and tomatoes and bacon and mushrooms and avocados and eggs and dry mustard! oh boy, am i smiling!! Aaaaahhhh. i love labor day. 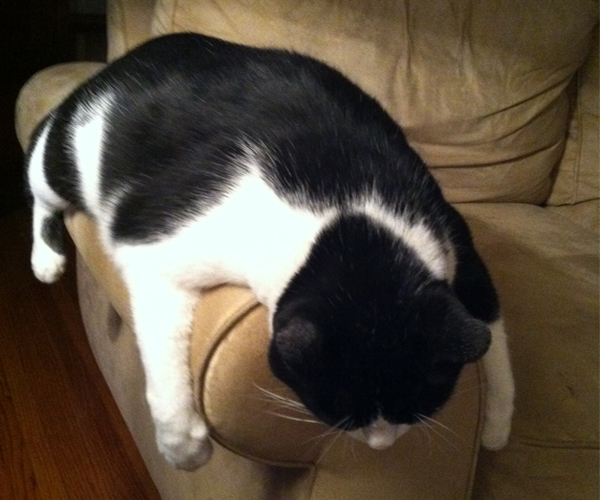 all i need after this catnap is a roast beef sandwich and some french fries. once in a while you gotta just get away from the routine and the stress of having to be someplace, and take it easy for a while. recharge those batteries. get the juices flowing again. aaaahhhhhhh. i’m feeling it now.